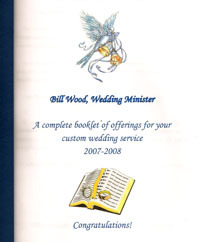 Bill's wedding service booklet contains sections of material which make up the wedding service; introductions, vows, ring exchange, poems, prayers and lots of additional material you can use to enhance your service. Also included are two complete services, one contemporary and one religious. Bill would be happy to mail you a booklet on request at no charge.